Discussion in 'Fluff and Stories' started by Warden, Sep 24, 2018. So in the old Warhammer universe we had lots of great maps. In fact, we have not only an entire threads worth of fantastic Lustrian Maps on this very forum, but a whole seperate thread on what Lizardmen Temple Cities look like. What about in the new universe? Age of Sigmar? I already started thinking about where the new Lizardmen/seraphon homes are in the Temple Ship thread, but what about the world... or rather the universe itself? It shows the realms, but that's about it. 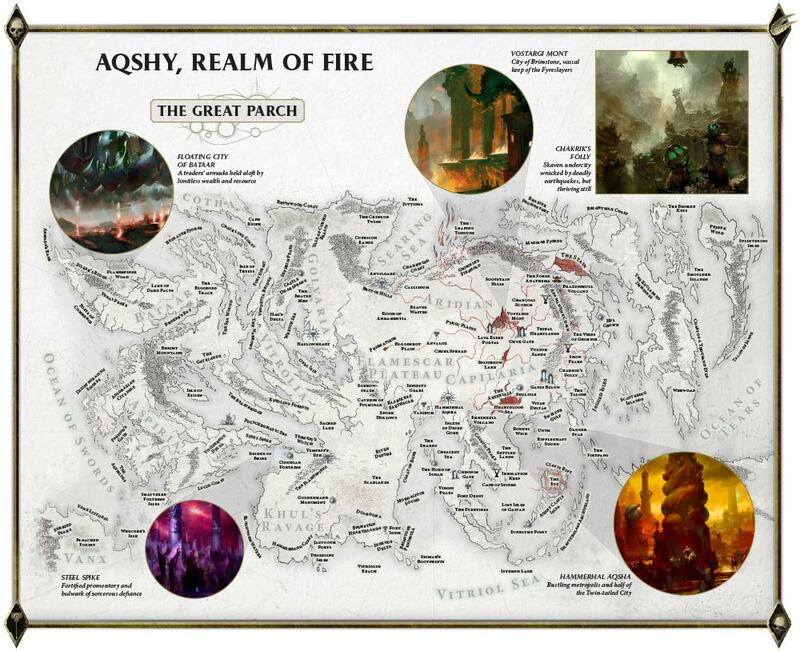 Anyone have any other AOS maps out there showing all the realms? What about the rest of the worlds individually? Lord Agragax of Lunaxoatl, Deed525, GN93 and 2 others like this. Very Dungeons-and-Dragons looking map, really neat. Deed525 and Paradoxical Pacifism like this. ^ This is a nice ^ diagram. Did you build it? I have seen one. Lots of ovals. Looked vaguely like an orrerrey sphere. GW made It. ...managed to be a little more excited. **there are maps and diagrams. I can relate. The maps are certainly pretty but they are so alien, it's hard for me to care who controls what. Now the intro to Game of Thrones with the Map of Westeros, sure it's clearly a fantasy land but it feels real enough that I care who controls it. Built this one a while ago. Need to start making my own.